I live in a small New Hampshire town that borders the White Mountains and the Great North Woods. On summer evenings, I love to take a 13-mile bike ride on rural back roads, where some nights I see more moose and bears than cars. But for the past seven years, each time I ride past the power line along the route I feel a knot in my stomach; a sense of impending doom; a preemptive mourning over all that could be lost, not just for me, but for everyone who enjoys this special place. Eversource Energy and Hydro-Quebec have proposed a high-voltage transmission line that would permanently scar 192 miles of some of the most remote and beautiful landscapes in the Northeast. A coalition of small farmers and businesses, environmental organizations, local politicians, a labor union, students from Yale University, and the chiefs of Canada’s Pessamit Innu First Nation have joined together with many New Hampshire citizens in waging a battle against this project. When this project was proposed seven years ago, the citizens of New Hampshire’s North Country organized an effective grassroots opposition, and individuals began undertaking extraordinary actions. Working dairy farmers turned down multi-million dollar offers to sell their property to Eversource, and instead protected their land with conservation easements. Local residents, business owners, and politicians have spent countless hours travelling to our state capitol and have worked with prominent environmental organizations like the Appalachian Mountain Club, the New Hampshire Sierra Club, and the Society for the Protection of New Hampshire Forests to battle Eversource’s corporate lawyers. State representatives and citizens have crossed party lines and found common cause in our love for remote and rural landscapes. I was disappointed and disheartened to learn that in the face of such strong opposition, my alma mater Yale University has enabled this destructive project by leasing a 24-mile right-of-way to Northern Pass through lands owned by Yale’s endowment. A project like Northern Pass has no place in the investment strategy of a university that purports to be “one of the first institutions to address formally the ethical responsibilities of institutional investors.” Yale’s deal with Northern Pass undermines the efforts of local citizens, farmers, and conservationists in the name of enriching the University’s $27 billion endowment. Yet this challenge has provided an opportunity to expand and strengthen our campaign. 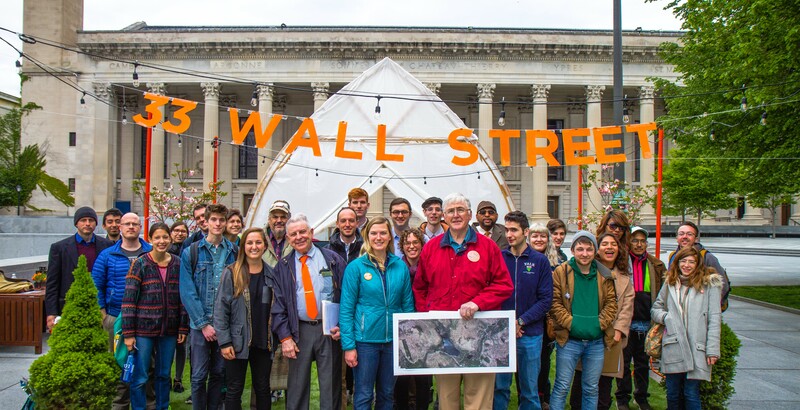 When I reached out to the Yale Student Environmental Coalition to raise awareness about Yale’s role in Northern Pass, student leaders organized a teach-in, wrote an article for the Yale Daily News, and contacted Yale’s Committees on Investor Responsibility. Their actions drew the attention of Local 33, a union representing graduate teachers at Yale. Local 33 members and other students testified against the project at the New Hampshire Site Evaluation Committee hearings and are urging Yale to act ethically on this issue and cancel their lease with Northern Pass. Our fight against this project is reaching new audiences and exposing additional problems with the transmission line. I am optimistic that our broad-based coalition will defeat Northern Pass, and I believe this campaign offers important lessons. In the coming years, large corporations will continue to attack our most beloved landscapes. The concentration of power and capital behind exploitative projects puts citizens and communities at a disadvantage. Protecting the environment requires the vigilance and advocacy of all who have deep attachments to the land. During an era of bitter electoral politics, American landscapes transcend partisanship, and we can use this power of place to build coalitions comprised of all stakeholders who are harmed by a project such as Northern Pass. Building relationships with unlikely allies like the students and alumni of Yale University, who care about their institution’s investment practices, can broaden a fight and create new opportunities to stop a project. Large-scale energy projects can harm communities in far-flung regions and even other countries. We must be nimble enough to transcend these boundaries by building relationships with stakeholders who are fighting different aspects of an exploitative project. To win, we must undertake the exhausting, creative, and inspiring work of sustaining collaboration among everyone who is willing to stand up and protect the lands we love. Thousands of people submitted written comments, and hundreds of citizens and intervenors spoke out against Northern Pass in public hearings. Members of the Pessamit Innu First Nation made the journey from Quebec to New Hampshire to testify before the SEC, as did students and community members from New Haven. When added to the voices of New Hampshire farmers, small businesses, tourism boards, and concerned citizens, our coalition demonstrated the regional scope of the issue and created a groundswell that could not be ignored. To call this a remarkable victory would be an understatement. In an era when corporations dominate public processes, it takes overwhelming grassroots action to defeat a project like Northern Pass. But these victories are possible when we build large coalitions of people who undertake the work and sacrifice that is necessary to preserve their environment and culture. Yale still needs to address serious concerns with Wagner Forest Management’s damaging practices on Yale’s investment lands in Coos County. But the movement that we have built gives me hope that in this and other struggles to protect our landscape, we will prevail. Liz Wyman is a writer, educator, and naturalist who lives in New Hampshire’s White Mountains. She is a 2004 graduate of the Yale School of Forestry & Environmental Studies.